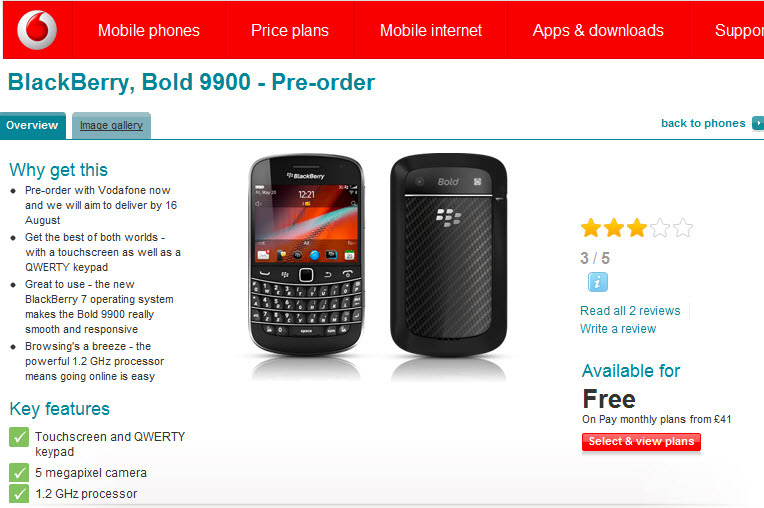 Finally Black Berry Bold 9900 is now Available for Preorder From VodaFone. As told before about the release date and place of this Black Berry 9900, it was expected that it might be coming to Canada on 9th of August. The release is near and Vodafone is allowing its users to preorder one Black Berry for their selves. This is something really strange that they will aim. This means that they won’t be getting before 16th of August. So hope so they ship it after 16th August. Any how if you are in Canada so you can get your hands on Black Berry Bold 9900 in few days or sometime because it was said that it will release in Canada on 9th of August as told before on Rogers. So you can preorder one for your self by visiting their official website.